Our kit is based, loosely, on a description of the dancers from Dilwyn, in Herefordshire, which mentions rosettes and ribbons. It is a modern myth that all border morris dancers wore rag jackets and blackened their faces. We wear: black shoes and trousers, white collarless shirts which are decorated with two blue and gold rosettes on the front and three on the back. 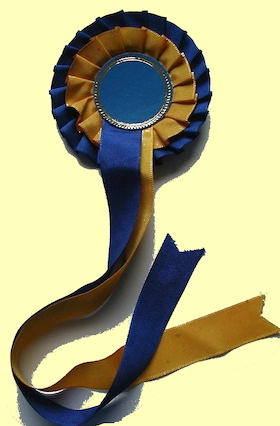 There are blue and gold ribbons attached just above the elbow, and three bells, on a blue strap, just below the knee, again decorated with blue and gold ribbons. This is all topped off with a black hat (design of the owner’s choice) with more blue and gold ribbons. We used to black our faces and most of the pictures on this website show that, but we changed for our winter 2016-17 season, removing the blacking but adding the hats. 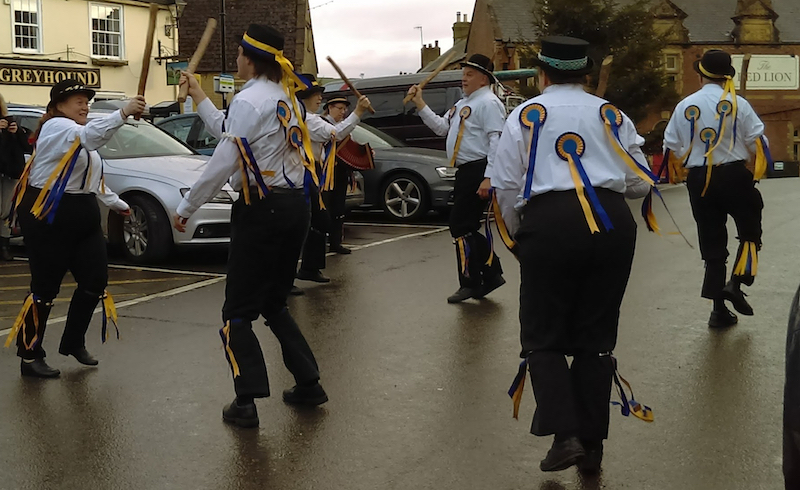 The team dancing in Beaminster on our New Year’s Day tour, 2018. Here are some more pictures of us.